It seems like such an obvious thing to do, but my students always told me that I was the only teacher they had who did this: all of their other teachers would learn their names over a longer period of time, casually, without making a special effort – or, they never learned their names at all. Many times over the years, students told me that this or that teacher had never learned their names, even when the students had spent an entire year in their classroom. They always said this with a note of dismissal in their voices – they believed those teachers didn’t give a damn about them. Teachers today – especially in public schools – carry an outrageous workload, one aspect of which is simply the vast number of students they are expected to teach. So I know that this idea can be daunting to the teacher who sees hundreds of students every week. According to the currently prevailing trends in public education, teachers are rather outdated devices for the delivery of standardized content, inconveniently inconsistent and unreliable, and soon to be replaced by technology. As I have written about here on Off The Podium, my philosophy of teaching is grounded in the development of relationships and community, and for me the practical application of this begins with the first time you meet the students. The most natural thing to do when you meet someone is to learn her name, first. Taking the time to learn your students’ names before you get down to the business of teaching communicates clearly to the students that you are interested in them – that you see them and recognize them as fellow human beings – and establishes the beginning of a relationship between you and each student. It will also, in the few minutes you spend on this activity, introduce you to each student individually, and for many of them, give you an immediate indication of their personalities. Of course you will have many important things to do when you first meet your students, especially in a school situation – distribute forms and have the students fill them out, go over the rules, syllabi, schedules, hand out materials, give initial assignments, and much much more. I strongly encourage you to put these things off for just a bit, and make an effort to learn your students’ names first. As far as I can remember, I started practicing the name-learning stunt when I was a music counselor at Fieldston Outdoors in the summers 1993 – 1995. This is a six-week summer camp which has been held annually at Ethical Culture Fieldston School in the Bronx, New York every summer since 1981. A big part of my work there as a music counselor, in addition to participating and eventually running daily camp opening musical activities and closing camp sing-alongs, was to teach classes every week to each group of students who moved through the camp’s many activities together. Campers were placed in groups of about 15-20 students by age or grade, as I recall. These groups would change every week – students might attend for one week or all six, or any other combination. I came up with this method for quickly learning students’ names spontaneously, and over time modified it to suit whatever learning environment I found myself in. 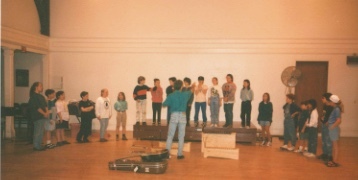 At Fieldston Outdoors and in many elementary school music classes I taught, the typical set up would be the students sitting in a semi-circle of chairs facing me, and I was also seated in a chair (with guitar to accompany many of our camp songs), but I learned to use the name-learning stunt in any set-up – when students were seated at desks in a traditional classroom, standing on risers in a choir, seated in orchestra rehearsal…whatever. Beginning with one side of the group, ask each student his or her name, one student at a time. Look each student in the eyes as you do this. If a name is unusual or you are not sure you heard it correctly, ask them to repeat it and/or how they spell it. Do not look at your roll book. Learn their names from them, aurally. After you have learned several of their names – usually 3 or 4, but not more than 5 – stop, go back to the beginning, and repeat each student’s name in the order that you have followed thus far, looking into each student’s eyes again as you do so. Repeat steps 1, 2, and 3 until you have learned the name of every student in the group. You may vary step 3 by repeating every student’s name you have learned in the reverse order followed thus far occasionally, just to keep things interesting, if you wish. Repeat step 3 in the new order. Move on to the rest of the activities planned for the class. Throughout the rest of the class, always address individual students by name while looking them in the eyes, and if you don’t remember it, ask them. At the end of class activities, before you dismiss them, repeat step 6 one last time. Inevitably, you will make mistakes, and the next time that the class meets with you, you won’t remember all of their names initially. Simply start over and do it all over again, in every class, until you have learned their names. If you do this at the beginning of every class until you no longer need to, eventually you will learn them all. I was successful with this stunt in groups of up to about 40 children. If you are directing a larger ensemble you may need to split the group up into smaller sections and only do the stunt with part of the group on alternating days, or some other arrangement. However, I discourage you strongly from resorting to name tags! 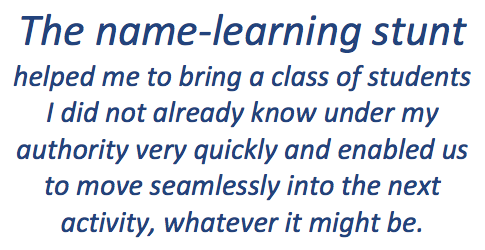 I don’t believe that name tags will help you learn names – rather the opposite. In almost every case, once students realized what I was trying to do they quieted down and listened, fascinated to see if I could do it. This activity helped me to bring a class of students I did not already know under my authority very quickly and enabled us to move seamlessly into the next activity, whatever it might be. If you are lucky enough to see your classes several times a week, within a few classes – a week was usually enough for me when I was seeing in the neighborhood of 150-200 students per week – you will no longer need to do this. You will know all their names! Spending a few minutes on this exercise at the beginning of each class will go a tremendous way towards establishing a relationship with every student. It will demonstrate concretely that you recognize each one of them as an individual, and you will present them with a model of focused attention as you attempt to load your own memory with information about them. It’s the least you can do, since the rest of your time with them is going to be spent making demands on their concentrations and memory. This article was published in the August/September 2017 issue of Choral Director magazine, and in the October 2017 issue of School Band and Orchestra Magazine. 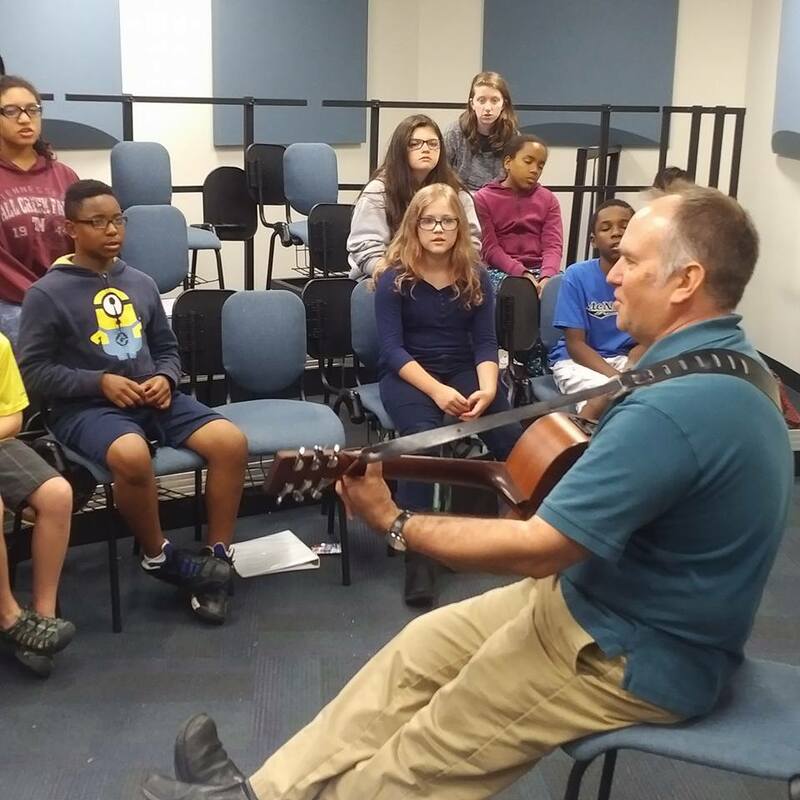 By walterbitner in Education, Music Education, Philosophy on June 24, 2016 . This is a great tip, and very true both how important it is, and how I have to make a special effort of it to actually learn the kids names. A colleague of mine taught me a twist to this game that the kids enjoy. Every first week of school, he tells the kids that he will learn their name by Friday, and says that he will pay them $1 if he doesn’t know their name then. It is understood that the entire first week is practice, and following this rule (and using the same technique you described) the kids are much more forgiving and accepting when I mess up. By Friday I knew everyone’s name, but my practicing became a fun daily game. I agree! It is so important to take the time to learn their names. I would also add that it is important to not only know their name, but also to pronounce it correctly. That’s why I like to have the students say their names before I make any attempts at saying them myself. Thank you for sharing! This means so much to a student when you call them by name. I love this method. The only challenge for me is that all my new students are Kindergarteners and being able to HEAR and UNDERSTAND their names is a total challenge. Thank you Elisa! It’s true with younger students that processing their names aurally correctly can be difficult. Especially when many students today have unusual and unique names!